Upon selecting Make a Payment from the Account - Payable menu, you will first view a page that allows you to decide which Sub-Account(s) your payment will apply to. You may choose all accounts, an individual account, or a selection of multiple accounts. 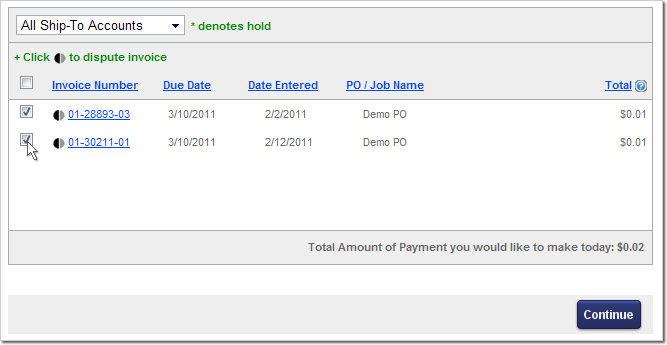 The second step lets you narrow down your invoices for selection (shown below). Choose to set up your payment based on: invoice date, ship date, the most recent statement, or show all unpaid invoices and select the ones you want to pay. Additionally, you can pay a flat amount, which will require you to provide written instructions for your representative, describing how you'd like the amount to be used. 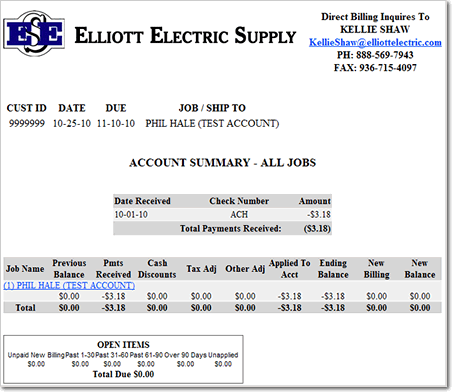 During the third step, select the invoice(s) you'd like to pay (example shown below). 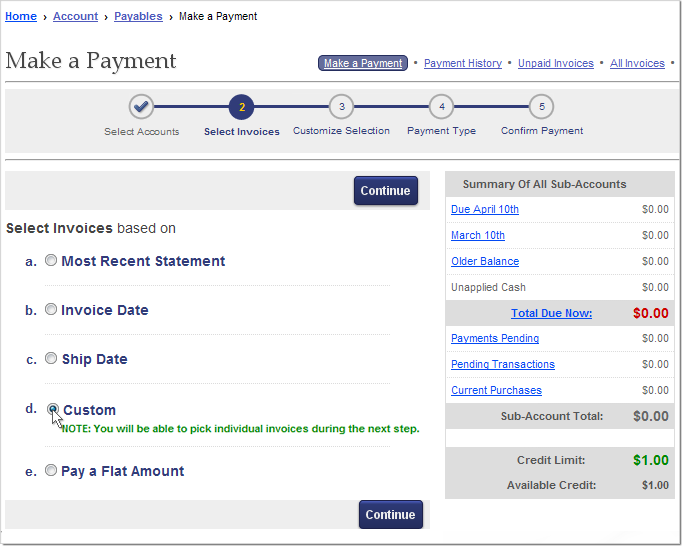 Your selection from the previous step will determine what invoices appear on this screen. Additional features of this step include the option to dispute invoices and options to sort the list by Sub-Account, Invoice Number, Due Date, Date Entered, PO/Job Name, and Total Amount. If you've chosen to "Pay a Flat Amount" (see below), the third step will not display a listing of invoices but, rather, prompt you for your name, phone number, and your instructions on how the payment should be applied. Remember: since the Flat Amount option requires your Elliott representative to manually apply the payment during normal business hours, the primary payment methods (i.e., selecting the invoice(s) online) will typically process the payment faster than 'Flat Amount' payments. The fourth step lets you choose a payment type—either ACH Bank Transfer or Credit Card. ACH Bank Transfers are quick and secure and may be used with any Checking or Savings account. 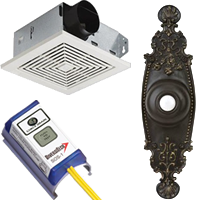 The ACH service is provided free of charge. Credit card and debit card payments require a total of at least $5.00. Card payments also require a convenience charge, which varies according to the card type: 4% of the total for American Express, and 2% of the total for Visa, MasterCard, and others. 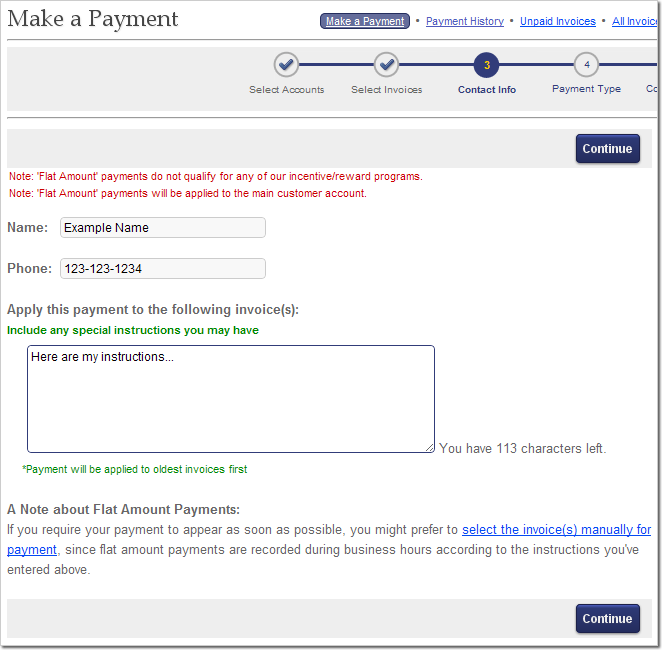 During this same step, enter your payment information during the. ACH Transfers will prompt you for your checking or savings account information. Likewise, credit or debit card payments will ask for your billing and card information. The final step of the payment process lets you review your payment details and confirm the payment's submission. Once the payment is submitted you will receive confirmation via email. You will receive one confirmation email for credit card payments, and two will be sent for ACH Transfers—the first upon initiating the payment, and the second upon submitting the payment to the bank. The Payments page lists your most recent payments, which can each be selected and viewed in detail, showing which invoice(s) the payment was applied to. Click the Search button at the top-right of the recent payments list to perform a search of all your past payments. The search bar will appear at the top of the page. It allows you to search your payment history by date range (i.e., payment dates), invoice date or number, PO/Job Name, Check Number, last four digits of the credit card used, or pending online payments. The default search method is by date range, but this can be switched to any of the other methods by using the drop-down menu to the left of the search box that appears. When you change search methods, the entry box will change accordingly. The search results page will contain a list similar to the Recent Payments table on the main payments page. 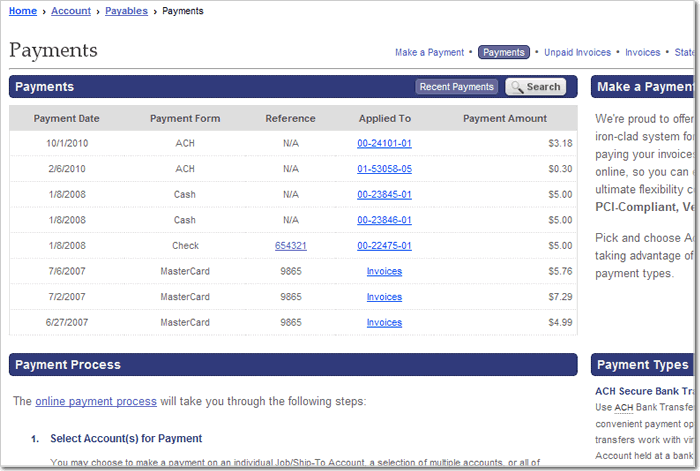 You can view the details of a payment by clicking its invoice number in the "Applied To" column. In addition to the advanced search tool for past and pending payments, the Payments page also includes an explanation of the payment process and payment types, along with a link to proceed to make a payment. 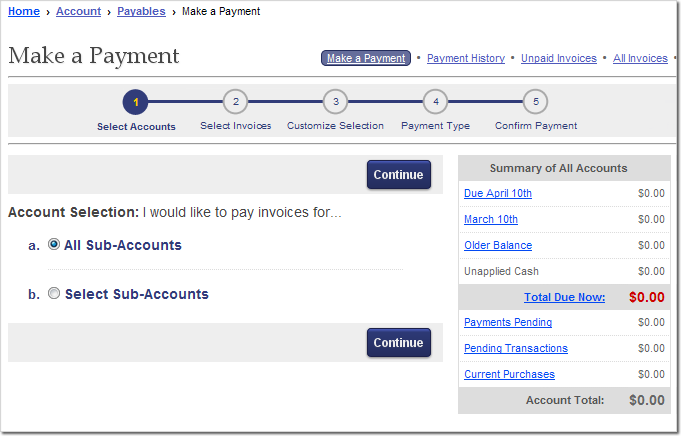 The Unpaid Invoices page shows a sortable listing of Unpaid Invoices on your account. You can use the drop-down box at the top to select individual or all Sub-Accounts—be sure to click the 'Display Invoices' button to update the list. Use the links at the top of the page to Email or Print the entire list of Unpaid Invoices. You may use the checkboxes in the list to select one, multiple, or all unpaid invoices, then you can use the Email, Print, Fax, Download, Dispute, and/or Mark as Acknowledged option links for the selected Unpaid Invoice(s). These invoice actions are hyperlinks located at the top of the table. Click an invoice number to view it in detail. In the Unpaid Invoices list, you may edit each PO/Job Name by clicking the Edit link next to the Job Name you would like to modify. The Invoices section of Account Inquiry allows you to search and view all Paid and Unpaid Invoices on your account. 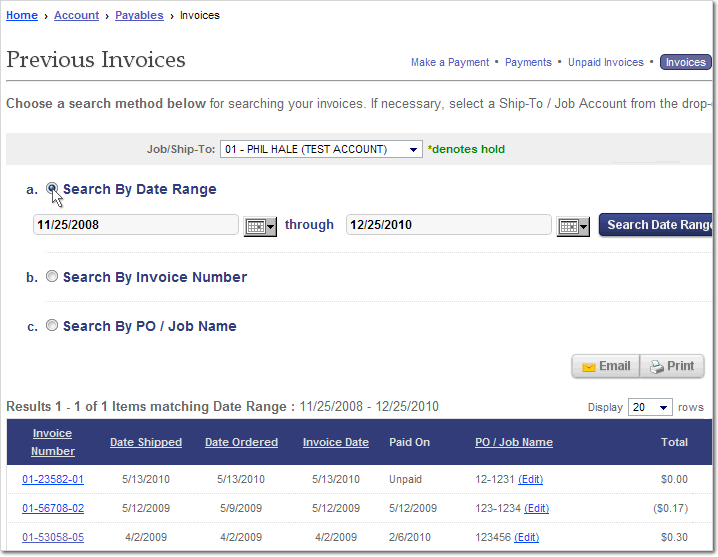 The three available search methods—Date Range, Invoice Number, and PO / Job Name—are displayed upon loading the page. Click one of the radio buttons near a search method to choose that option and enter your search parameters. Above the three search options, you can use the drop-down menu to specify a single Sub-Account, all open Sub-Accounts, or All Sub-Accounts (both open and inactive/completed). If you use the default search method, Date Range, you will be able to specify the Start and End dates and click the Search button to see all invoices issued during that date range. Both the Invoice Number and the PO/Job Name search options will give you a typical text-entry search box, which, once submitted, will return a list of all invoices that contain the Invoice Number or PO/Job Name you entered. Any invoice from the listing can be viewed in detail by clicking on the invoice number. Use the Email and Print buttons to export the entire list of search results. You may edit the PO/Job Name on an invoice by clicking the Edit link next to the Job Name you would like to modify. The main Statements page shows a listing of each monthly statement for the current year with options to view past years at the lower-left (up to three years back). 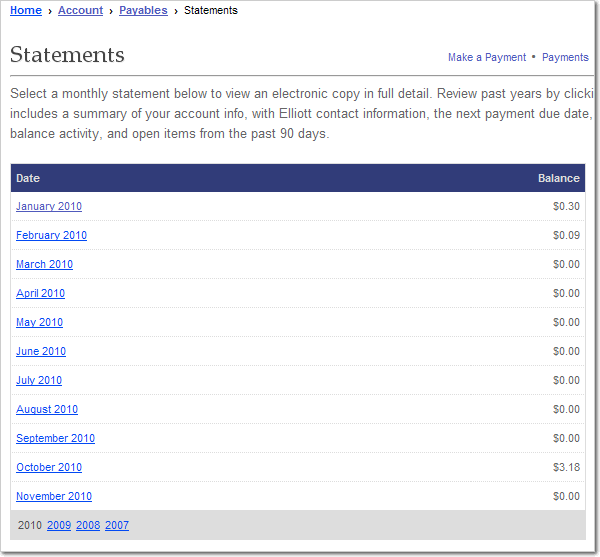 Each month's balance is shown to the right of each monthly statement. Each online statement includes contact information for any billing inquiries, a 'Received Payments' section listing each payment type and the date it was received, the balance, billing, and payment details for each job, and an Open Items section, detailing new and unapplied billing for the past several months, along with the selected month's 'Total Due' amount. You can export an online statement by using the Print and Email links at the top-left of the statement details page. 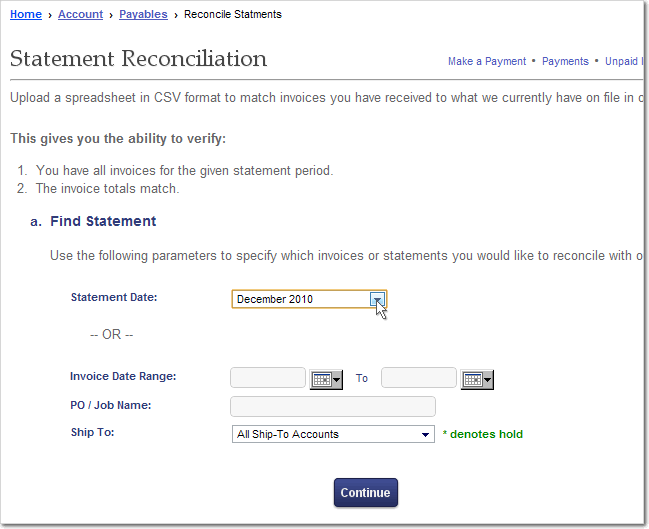 The Reconcile Statements section is a series of three pages that allow you to upload the invoice information that you received and compare it to what we have on file for your account. This allows you to verify that you have received all of the invoices for the given statement period and that the invoice totals match. First, select a statement date from the drop-down menu OR, specify an invoice date range, PO / Job Name, and one or All Sub-Accounts from the drop-down menu. When your selection is made, click the Continue button. On the second step, click the Choose File button, locate your .csv file, and click Submit File. See the on-page guide for how the CSV spreadsheet should be arranged, making sure to include each Invoice Number in the first column. The final step will tell you if the invoices reconcile successfully. If differences are found, the page will list them (detailing, for example, which invoices are missing, or which totals do not match).